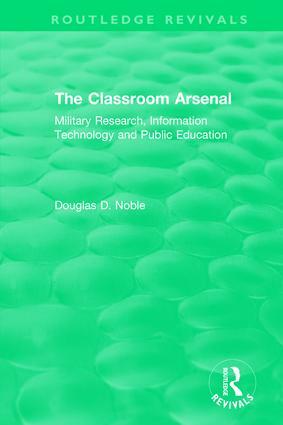 Originally published in 1991, Douglas Noble traces the enormous, yet uncharted, influence of military research and development on post-war American public education, drawing implications for current debates about the means and ends of education in our technological society. As a case study, the book provides a detailed account of pioneering experiments in computer-based education which took place during the late 1950s within the context of military research on man-machine systems. By extracting key paradigms of this military research and demonstrating their continuity with the most recent research in computer-based education. Noble offers a new, historical perspective on the significance of computers for education. The conclusion offers a provocative analysis of the political economy underlying the recent alignment of education with technological developments in computer science, artificial intelligence and cognitive science. List of Abbreviations. Preface. Introduction. Part 1: Background 1. The Military and Public Education: An Overview 2. The Military Worldview and the Human Factor. References to Part 1. Part 2: The Military Context of Pioneering Experiments in Computer-Based Education 3. The SAGE System 4. The System Development Corporation 5. The PLATO System at the University of Illinois 6. The IBM Research Center 7. Bolt, Beranek and Newman. References to Part 2. Part 3: Recent Developments and their Implications 8. Recent Computer Education Research: Old Wine, New Bottles 9. Human Engineering in the Information Society: The Deeper Meaning of Military Technologies in Public Education. Conclusion. References to Part 3. Index.